Gate Repair Technicians At Your Service! Get a new custom gate installed to improve security and add curb appeal to your property. Your driveway gates affect how people see your property. The same goes for a storefront gate. The way your home or business looks is important, as it sends a message to visitors. A well-kept property or one that looks distinguished or prestigious, is sure to make a great first impression. One of the first things people see when they approach your home is your driveway gate, which is why it's a good idea to get one with a lot of curb appeal. The case is similar with roll up storefront gates, especially if you own a business that relies on visiting customers. Of course, curb appeal is not all a gate is good for. With automation and other various features, it can add a great deal of security to your property, and make interacting with visitors a lot more convenient and simple. What your gate is made of is incredibly important, as it can make it very easy to maintain, or a real chore. Wrought iron gates are famous for their ornate beauty and prestigious appeal, but they need to be checked for rust and repainted accordingly every so often. Wood is another beautiful looking choice, with its classic charm and appeal, but it too needs to be covered with a protective layer of paint, to prevent it from warping or developing rot. A steel gate can add a lot of security and privacy, due to the fact it can be built as a single panel. However, that means it will be heavier, and will need a certain amount of horsepower to move. With shops and stores, the gate serves a security purpose above everything else. It needs to protect your business from burglars and forced entry, which means it needs to be made out of durable materials that can withstand blows. A steel roll up gate is the common choice for storefronts, and for good reason. This type of system can provide enhanced security that will keep your products and wares safe. It takes up very little space, as it simply rolls up when opening and doesn't need any space out front or to the sides the way swing or sliding driveway gates do. If you're looking to add to your store's security, then a roll up gate would be an excellent choice. There are a few options in terms of gate mobility, but there are three that tend to be more common than the rest. A swing gate is built similar to a regular door, with hinges that control its motion. It needs room to maneuver, of course, so if you lack that but have a lot of space beside your driveway, a sliding gate may be more appropriate. It moves laterally, like a classic patio door. Of course, if both of these are not feasible choices, there's always a lifting gate, which simply rises (as the name suggests) and lowers at a 90° angle. You've seen those before, mostly at the entrance to commercial parking lots and other business establishments. What could be better than to be able to open and close your gate from virtually anywhere? Well, with a modern electric opener unit, that's very possible. There are also intercom systems that can connect to this device and allow you to "buzz" people in without you being home at all at the time. It's important that you find the kind of devices that suit your needs, though, as there are all sorts of options available today, and choosing one that isn't a great fit can lead to problems later on. Our team of experts will happily consult you on the various different aspects of buying a new driveway gate. Once you decided on the material and all the extra features you may want, our technicians will carry out the installation of your new system and ensure it's functioning smoothly from day one. 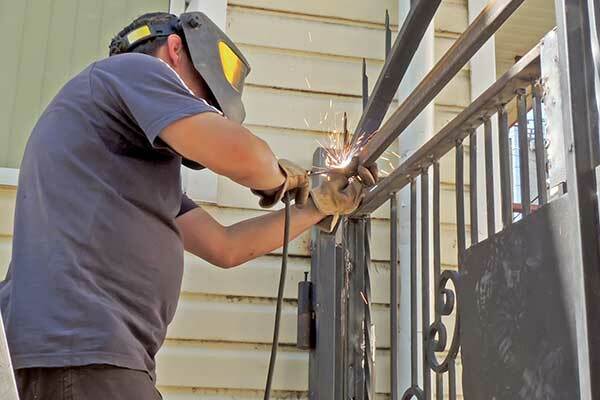 The technicians from Gate Repair NYC have the skills and experience to help with any type of gate, opener, or intercom-related problem you may encounter. From roll up storefront gates that get stuck to driveway entrance systems that fail to open. Whether you need a track welded, an opener rewired, or a new intercom system installed, you won’t find the same level of high quality service for the same low and affordable price anywhere near New York. 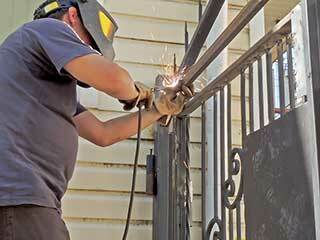 Contact us Sunday through Saturday for same day gate repair services. *Prices may vary. $45 service call. The appointment was set successfully! Thank you for choosing our company! Feel free to browse our website for more information in the meantime. Our team at Gate Repair NYC is at your service any time!